UPDATE – June 25th, 2018: The first issue of Lucent Dreaming is now available to read for free online! You can find the .pdf version of the issue right here. It’s finally time for another elsewhere post! 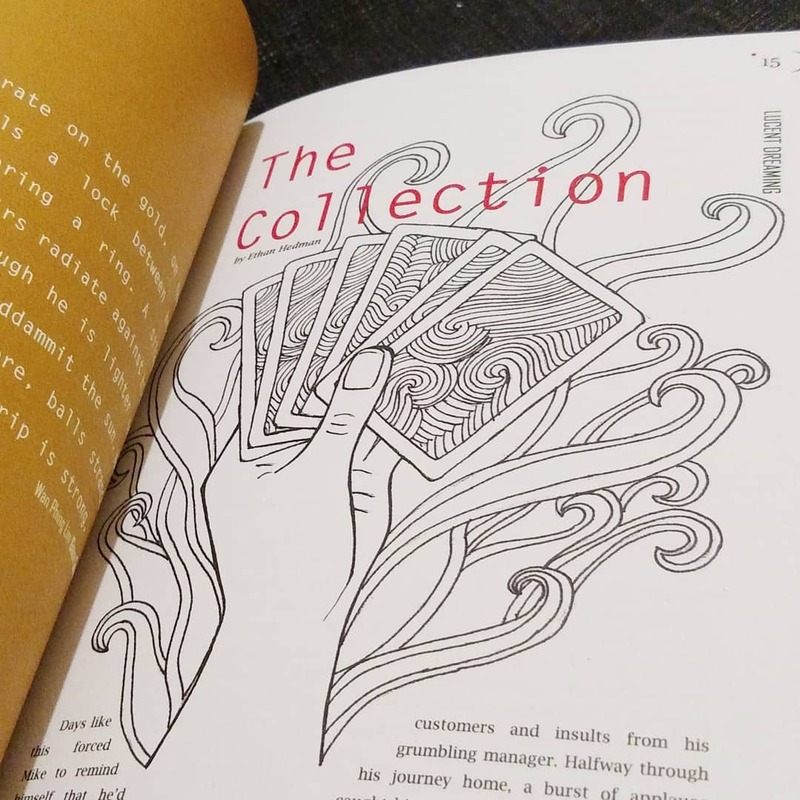 A short magical realism story of mine, The Collection, is now available in Issue 1 of Lucent Dreaming, a new creative writing magazine from the United Kingdom. The Collection follows an ordinary guy who quickly finds himself surrounded with a bunch of eccentric performers. It’s my favorite story I’ve had published so far and was among the first pieces of short fiction I wrote, the first draft being written near the end of 2016. The Collection went through quite a few edits and submissions afterwards, since finding the perfect home for magical realism stories can be a little tricky. 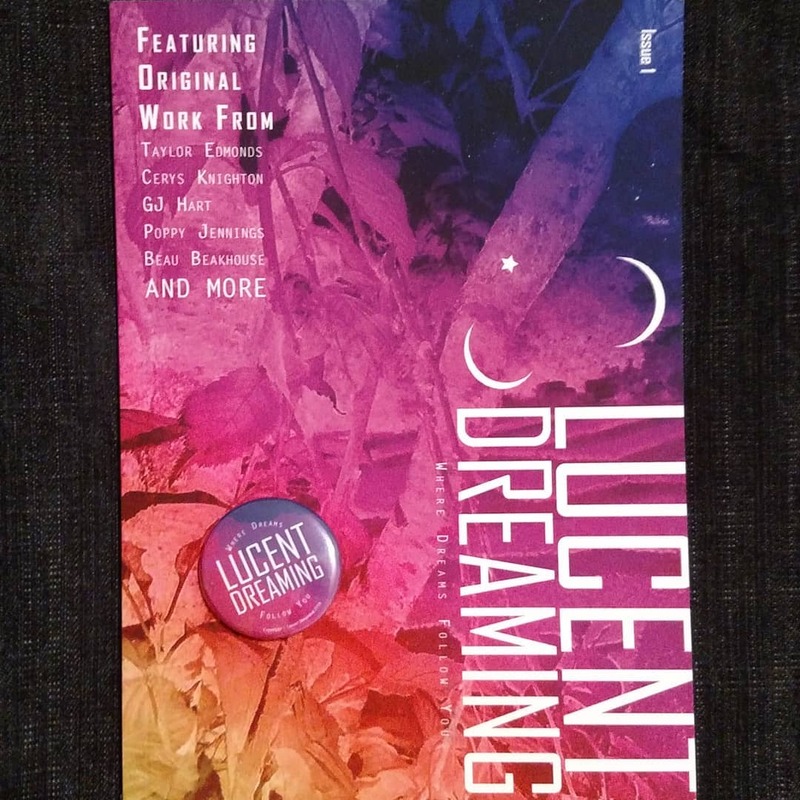 I was thrilled when the folks at Lucent Dreaming accepted it, and their editors were a tremendous help in making the story the best that it could be. At some point The Collection will be available on Lucent Dreaming’s website. In the meantime, it’s exclusively found in the gorgeous print edition of their first issue. You can snag a copy for yourself here (unless you’re in Europe or the UK itself, in which case it’ll be even cheaper). By the way, more stuff is coming! I’ve started listing pieces which have been accepted but not yet published in my bibliography with “Forthcoming” in lieu of a publication date. Feel free to swing by and sneak a peek at some upcoming titles. The solemn tone of the great horn echoes through the city walls, signaling the passing of King Aldamus II. Nobles gather in the court to await the crowning of his heir. Commoners whisper wild gossip about their king-to-be, hoping to steal a glance of the young ruler during his customary ride through the capital. Before the occasion can take place, all are kept waiting while the late king’s final wishes are fulfilled. Aldamus II’s will is the shortest in the kingdom’s history. It proclaims that four letters are to be delivered at once to the members of the royal family, carried by the late king’s most trusted servants and elite soldiers from his guard. The contents of these letters are not to be discussed, and the letters themselves are to be burned after each recipient declares themselves to have finished. Any interference with the delivery of these letters will be forcibly quelled, without exception. The servants set to their tasks at once, each delivering their letter to the appointed member of the royal family. What follows here is the best kept of secrets: a complete account of the late king’s lost words. I have ruled our land for decades, crushing invaders and rebellions alike. I have led our people through famines and plundered the dens of my rivals for their fortunes. These deeds have made me beloved. Yet these accomplishments are nothing at all when compared to the future I have gifted our kingdom with. My time runs short. It pains me to leave you, your siblings, and your wonderful mother. I find comfort only in knowing that you shall rise in my place. You shall be a great king. You must be an even greater king than I. Read these words well, son, for they shall soon be burned. I have written simple goodbyes to your siblings and mother on the same terms so as not to arouse suspicions. I chose the most loyal of my men to deliver your letter. Those who stand before you now will serve you well when I am gone. Yet, as a king, you cannot trust. The nobles of the court will use my demise for their own ends, wishing to warp or limit your newfound power. Chief among these malcontents is Lord Bandric Robur, an ardent opponent of our monarchy. Beware all nobles, but beware Lord Robur most of all. I advise you to speak carefully with each member of the court at some length. Declare these private conversations to be in the spirit of sowing the seeds of friendship among your newfound vassals. Assess them with great care. It is essential to determine who is loyal, who can be swayed, and who may soon rise as an enemy. In all cases, you should keep each Lord on the shortest leash they are capable of tolerating. Pay little mind to the cries of common folk. The values of our kingdom would rot if they were left to their own devices. You must rule all of your subjects with clear vision and rapid action. Demand total loyalty and accept nothing less. Strong leadership will guide them through any difficulties they may come to face. At the first opportunity–be it that of banditry, foreign agitation, or an uprising–you must prove your strength. Crush the first enemies who would dare to stand against you. In doing so, you will forge a reputation that shall be forever feared and respected. You have made me as proud as any father could be. I leave this world in your hands. Your presence in my life has been a remarkable gift. In life’s darkest moments, you’ve been a shining light. You’re quick to joke and sing if only to make me smile. I have needed you many times more than you could ever know. Thank you, my dear boy, for each and every treasured moment. As I die, I need you more than ever before. I need you to take what I believe to be your rightful place. I need you to tear the rule of this land from your brother and seize power for yourself. This will be no easy task. It is, without question, not legal. How I wish you had come first. Aldamus is my heir, and our ancient laws dictate that I cannot name another in his place. He shall be the king as long as he lives. Aldamus will rule with force, to be sure, but without a single drop of intellect. The true strength of our kingdom–strength that comes in clever, cautious rule–will crack beneath his steel gauntlet. I have no doubt that you know this already, but I tell you as your beloved father: you must take the throne from him, by any and all means necessary. Observe the beginning of your brother’s rule with care. The nobles will not tolerate a king who seeks to oppress their rights for long, and Aldamus shall certainly take steps to do so. Lord Robur has never shied from speaking his mind against the monarchy and could prove to be a valuable ally. You would be an ideal compromise; a king, to be sure, but a friend to the court as well. Lord Robur’s knowledge of the nobles, their positions, and their desires is second to none. Use him. Take care, however, when dealing with such men. Their lust for power rivals that of your brother. There must be give and take in negotiation, but you should not allow other clever men to outmaneuver you. Keep yourself ahead of every other man and make yourself essential to each figure in the realm who counts for something. Do not forget: no matter what you must do, your means will always justify your ends. It was you who should have been first. You should have shared my name. I have faith that you will find a way to claim your rightful place. I know that you will rule with wisdom and make me very proud. It is with great pain that I must leave you, but I am comforted in knowing that you shall shed tears for my passing. My love for you is as deep as an ocean, and knowing that your love for me is just as true has warmed my heart since the first moment you spoke. You are my everything, sweet girl. I have always indulged you in every way I was able. Now, for the first time, I must ask something in return. I must ask you to rule in my stead. Aldamus is an arrogant fool who will amount to little more than a tyrant drunk on power. Derren is the least trustworthy man in the kingdom. A squabble for power is inevitable, and so long as either of your brothers sit upon the throne, our people will surely suffer. There is cunning and intrigue in the court. You must keep a practiced and pleasant demeanor. I doubt this will be hard for you, as you have always shown friendship to all. But be wary of these people who consider themselves the betters of others. They will do anything they can to raise their own station without the slightest care of how it will affect those beneath them. You must become a champion of the common people. Take up their causes as your own. Your brothers are sure to ignore their woes; the commonfolk sorely need the promise of a compassionate ruler. Become the voice that shouts to sate their hunger and cure their ailments. The people, when united, are unstoppable. The time will come when one of your brothers will need to be dethroned. You will accomplish this with the will of the people. I ask you to take heart in knowing that you will do what you must for the good of each soul who makes their home in our domain. You will be magnificent, and I am so sorry that I could not live to see your bright future. I love you, my sweet champion; now, forever, always. You have always asked for honesty in its entirety, and I have strived, whenever possible, to indulge you. The time for pure, brutal honesty has come. I shall bear my soul to you, here and now, as I lay passing into death. I care for you deeply, make no mistake. All the same, I have at times regretfully resented your presence in my life. You were not the one I wanted when our marriage was arranged. There was another. I have never understood how you could so easily accept being given to a stranger. Even now–no, especially now–I cannot understand how you could ever have wanted me. You are a wonderful mother. Your love for our children is unconditional. It is your very nature to love. I know that you still have love for me as you read these words, though I wish that you did not. I wish you had not married me. You deserved so much better than what I have amounted to. It may mean nothing now, but from the depths of my heart, I’m sorry for what I’ve done, and damnably sorry for what I must now do. I have set our children against each other. I’ve contemplated this wretched plan for months, trying to convince myself that such a thing could bring nothing but misery. Alas, I know now that this must be done with my last twinge of life. My words will evoke the strength of Aldamus’ brutal ferocity, Derren’s sly tongue, and Illia’s loving heart. One of our children shall succeed in casting their siblings aside, and in the wake of their methods our kingdom will thrive with a king or queen reigning utterly unopposed. Our family’s suffering shall bring prosperity to the people. The realm will be secure for centuries. I will not be present to see the coming fate of our land. I’m so sorry, my beloved, but neither shall you. Your love has made you the sole obstacle that could cripple this utopia in its infancy. You cannot be allowed to stop what I have put into place. Even if I had not confessed my vile scheme, you would have found a method to make peace between our children. I will not give you the opportunity. When you have finished with the letter, you will be given a vial. You must drink willingly from this. It contains a painless poison that shall let you pass on peacefully. If you do not, my guards will force the substance down your throat. Your heart will be said to have stopped while reading this last farewell. Should you break the vial, you will meet with an unhappy accident; a much more painful fate than I would ever desire for you. I have no words to express what I feel. An apology isn’t enough. It could never be nearly enough. Perhaps we will meet again in death, and you can take your righteous revenge. No, I know that your heart will conquer your hate. I hate that you can so easily conquer your hate. I’m so very sorry, my dear. I regretfully await you. UPDATE – October 26th, 2018: There’s now a paperback anthology of Trembling With Fear’s first year of fiction including His Cousin’s Tale available on Amazon! Surprise! Two of my stories are out in one day. The first was Strands of Glory, published right here on my site, and can be found below (or in an accompanying email in your inbox, if you’re part of my mailing list crowd). Now, onto the second: His Cousin’s Tale, a barside retelling of an ominous warning in a mysterious fantasy world. This one’s a bit of a love song to the wonderful atmosphere conjured in tabletop roleplaying games like Dungeons & Dragons and Pathfinder. It can be found here, in today’s issue of Trembling With Fear, a weekly publication of dark short fiction on HorrorTree.com. By the way, more publications of mine are coming, I just don’t quite know when. I’ve signed a few paying contracts for pieces recently, which is tremendously exciting for a fledgling writer, haha. Be on the lookout for more! Hanna sat in the booth of a small corner cafe, sipping from a large mug of coffee as she flipped through her book. It was an old, wrinkled paperback filled with stories and legends of her people. She’d uncovered the tome from the bottom of a book bin at a mom-and-pop thrift store. Years of use had split the book’s spine cleanly in half; Hanna had taped it back together, pressing a strand of her hair into the fold. The spine had been perfectly resilient ever since. Hanna was, in truth, not Hanna. Or, at least, she wasn’t just Hanna. Hanna was an outfit. Not a costume, by any means, but a presentation. She was like a bride aglow in her wedding dress or a military officer in a finely tailored uniform. Hanna was youthful and calm. To mortal eyes she seemed ordinary enough, though her waist-length hair would still attract some attention as it flowed gracefully behind her. But beyond the simple projection of Hanna, she was truly so much more. She was Hariasa, a goddess lost to time. Hariasa was an ancient deity. She commanded legions of devoted worshipers in her prime. Most were fierce warriors, lusting for the glory of honoring her name in battle. The greatest of these were granted strands of her hair, precious tokens which never failed to bring out the peak of their natural talents. Bloody conflicts were fought for her honor. Great halls were raised in her name. She would be toasted for eternity by her bravest warriors, all spending their afterlives feasting in Asgard. Yet her legacy came crumbling down. Other beliefs took hold among the mortals through conquest, correspondence, and connivance. The worlds of Yggdrasil are deeply intertwined; the gods of Asgard found power in the beliefs of their human worshipers in Midgard. When those beliefs wavered, their strength fell alongside. Asgard exists as a shadow of its former self, inhabited solely by the few transplanted dead worthy to partake in the pleasures of Valhalla and Fólkvangr. Asgardians may come and go, but all are drawn back to the hopes and dreams of power that Midgard might still offer. They wander the world hoping for opportunities to seize any fragment of glory they can before the coming of Ragnarök. Some of the pantheon managed to forge small but solid footholds for themselves again. Thor had amassed a brilliant following which outdid the rest of his colleagues. He convinced a comic writer of his potential as a modern-day superhero and rose to global adoration in the blink of an eye. Others, too, had been elevated with their mythology’s refurbished popularity; Loki loved being loathed as Thor’s villain, and Odin reveled in his newfound status in literature as a divine con artist. The gods were trickling back into prominence, and they all clung fiercely to the hope that the trickle might reform the rushing river of their past. Hariasa was content to play a long, steady game. She drifted slowly, a decade at a time, from one place to the next. She worked simple jobs and rented affordable rooms. Her guise as Hanna was her vessel to connect with mortals, her method of attaining small, comforting moments of adoration. Hariasa was forgotten, but Hanna could reach people. She could listen to people needing to talk and give a shoulder to cry on for those needing to mourn. She gave meals to the hungry and did favors for her neighbors. Now and then, when someone was struggling beyond whatever they could take, she would weave them a bracelet to bring them good fortune. Her trinkets always hid a single strand of her hair within their braids. The mortals didn’t need to know who Hariasa was. She had changed. Her old self was nearly as forgotten to her as she was to the world. She no longer craved the battles and halls which had once glorified her. The love of the people she touched was more than enough. This is my first “elsewhere” post! I’ve had a little bit of work published elsewhere already (namely by 600 Second Saga and Speculative 66, both of which are wonderful), but the works in question were published before I had my own site up and running. When something I’ve written heads boldly out the door and plants a flag somewhere else, I’ll likely make post like this indicating where it can be found. In this case, it’s a brief fantasy piece in the form of a letter titled Succulent Triumph. It’s the featured letter of the month at Wax Seal Literary Magazine, a new online publication which offers short, letter-based fiction on a monthly basis. Take a peek by clicking here! We’ll make ’em pay twofold for our past defeats!